Camping in a tent is a fun and memorable experience for the whole family. Tent camping is good for your sense of adventure as well as being good for spending time with the kids. To make sure your experience is a great one, consider these tent camping tips. Be sure to make use of a rain-fly. It provides rain protection for you and your belongings. A rain-fly is a tarp that covers the top of your tent to shed rain and condensation. Many tent models come equipped with a rain-fly made to cover the doors and windows, allowing them to be opened for air flow while still discouraging water from entering through them. 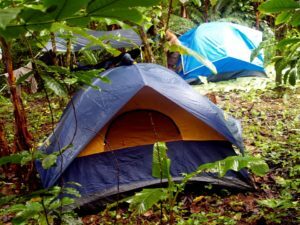 Also, bring a tarp for laying beneath your tent to shield the flooring from water, dust, and anything sharp trying to make its way through such as sticks or rocks. A plastic tarp will be sufficient for a groundsheet, just be sure it is a bit smaller than the floor of your tent to avoid water puddling around the sides of your tent. If your tent is new or you haven’t used it in quite awhile, you should set it up and inspect it prior to your camping trip. Inspect all the joints as well as the stitching to make sure there isn’t a hidden weakness anywhere. You should waterproof your tent yearly and check the seams, too. Use a high quality seam sealer if you find any tears to get the longest life out of your tent and the gear you’ll be storing inside it. When you arrive at your campsite, find the flattest area to set up on. Make sure you are setup in the highest area of the site in case of rain. Water will run down to any low areas of the site so camping high will keep you dry. You can use a special mallet made for driving camping tent stakes or a hammer to make sure your tent is well staked and secure. Strong, light weight aluminum stakes are generally the most effective option for stability as well as durability. Make sure your tent is securely anchored prior to retiring the first night of your trip and also check it each day. You can bring along a small whisk broom to maintain the interior of your tent and keep the outside out. You can also place a small doormat or carpet square in front of your tent’s door so you and the rest of the family can clean your feet before getting in. When it’s time to pack up and go home, make sure to remove any dust and dirt from inside your tent. Check to be sure it is completely dry before storing it away to prevent mildew from growing on it. Tent camping can be a lot of fun and we want you to be as comfortable as possible. Try these tips and call us for the perfect camping spot next summer. We look forward to your visit.